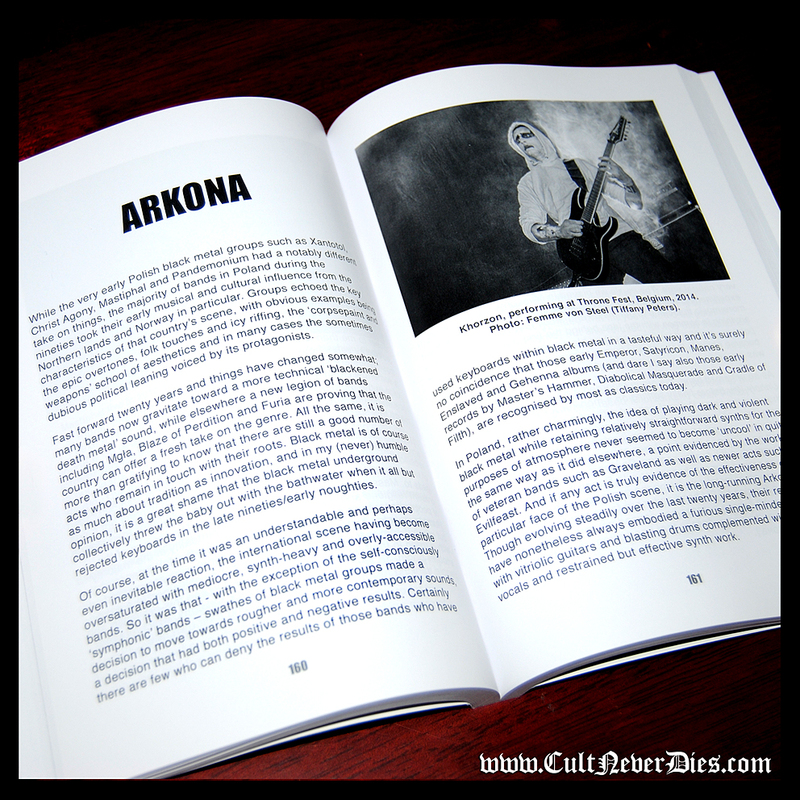 A publishing house and clothing company specialising in books and official merchandise relating to black and underground metal. Est. 2013. Features exclusive interviews with: SATYRICON/STORM/MOONFOG • MANES • KAMPFAR • SOLEFALD • WARDRUNA/JOTUNSPUR/GORGOROTH) • XANTOTOL • ARKONA • MASTIPHAL • EVILFEAST • MGLA/KRIEGSMASCHINE • STRID • BETHLEHEM • SILENCER • FORGOTTEN TOMB • TOTAL NEGATION + Artist THEODOR KITTELSEN and his impact on black metal aesthetics. "Patterson focuses on three strands of black metal - an expanded Norwegian chapter, plus the Polish scene and the depressive/suicidal black metal subgenre - dissecting each thread in minute detail with the assistance of the musicians themselves. This is where your value for money comes in: most of these headbangers have never opened up before about their music and the philosophy that drives it... It's a mighty achievement and may Satan usher in a second volume before too long…through a series of exclusive interviews Patterson gives ample space to bands who though underground were able to make a mark in the extreme scene." “Throughout my 20 years with Kampfar I’ve done hundreds of interviews with everything from hobby journalists to professional full time journalists. 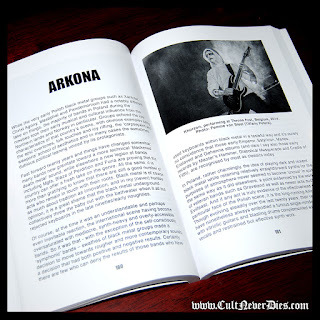 I’ve even done some interviews with authors who would like some help with some informative pieces they would have in place, in relation to particular Norwegian black metal anno early nineties etc. Very often these interviews are very similar and without any depth unfortunately. A good book, written with passion and expertise, and also accompanied by a carefully put together gallery." 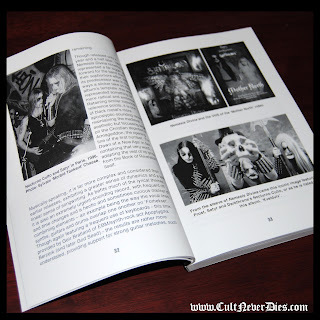 “The aim of Patterson’s project is nothing less than to produce a comprehensive picture of the phenomenon of black metal. 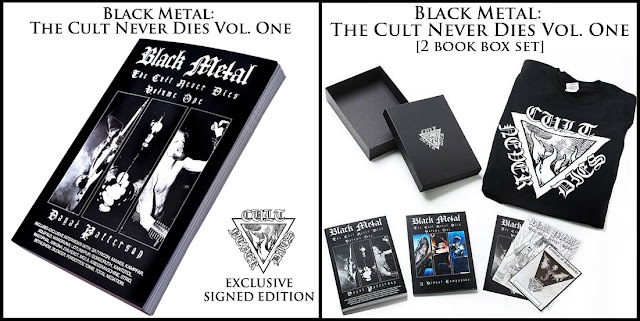 ‘The Cult Never Dies’ is more than just an appendix to the 2013 book… the publication guarantees precious reading and is richly reinforced with private photos." "The book is flooded by unpublished pictures and exclusive interviews, many of which from musicians who never spoke in public before (such as Silencer). 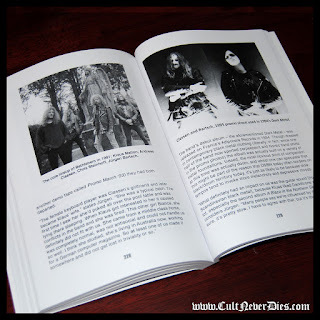 The chapters include a more detailed return not only into the Norwegian scene, but also Polish Black Metal, with additional touches of Depressive/Suicidal Black Metal." “Giving interviews is not my absolute favorite thing in the world but I always feel very assured that my answers are in safe hands and that the outcome will be as good as it can when doing an interview with Dayal. 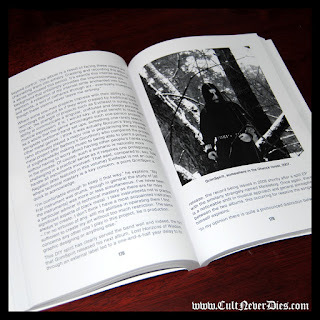 He is a reflected and observant man and he has an artistic, sharp and clever style of writing"
As comprehensive and no-gravestone-unturned as last year's Black Metal: Evolution of the Cult was (named as K! 's book of the year, no less), it still couldn't fit everything black and nasty in... The first volume of this bolt-on is as thorough and compelling as the original, with the author's attention to miniscule detail making [it] as genuinely essential as anything in the author's main book. 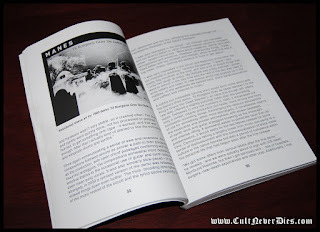 "If Black Metal: Evolution of the Cult is the course literature for the foundation course in black metal, Black Metal: The Cult Never Dies is the literature for the intermediate course." "Once again the book is packed with the sort of detail that delightfully exposes the quirks and peculiarities of the characters behind this unusual musical genre...another praiseworthy attribute of this fascinating book: because the individuality and strong will of the main characters come strongly to the fore through the interviews, you can’t help as a reader doing your own research about the bands you don’t know as much about, if only to find out if their music corresponds to their often bizarre and unusual worldviews. Another fascinating book by Dayal Patterson. He now firmly establishes himself as an erudite and noteworthy author, and I am already looking forward to his future work."